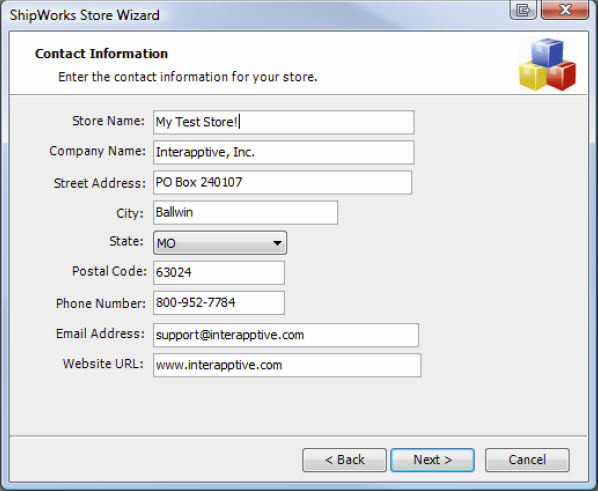 NOTE: The PayPal Bill Me Later status codes do not work with the current version of Shipworks software. A fix is being worked on by the Shipworks team. ShipWorks connects to your online store, downloads your orders and makes it easy to create shipping lables, manage customers and emails. You can download ShipWorks from the following URL. Choose to run the installer and proceed with the installation. The Setup Wizard will walk you through the installation process. After completing installation and setting up the database, you are ready to setup ShipWorks to connect to your online store. To open the Add Store Wizard, choose "Manage > Stores..." from the main menu, and then click the Add Store button (the green plus sign icon). 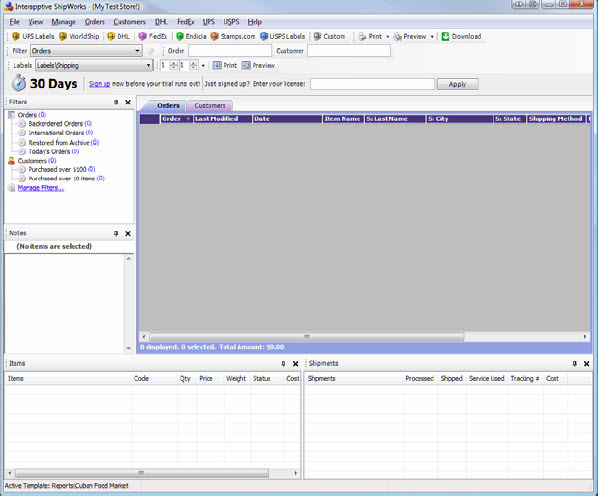 You can try the full functionality of ShipWorks free for 30 days. To initiate your free trial, simply select AmeriCommerce online stores and click Next. 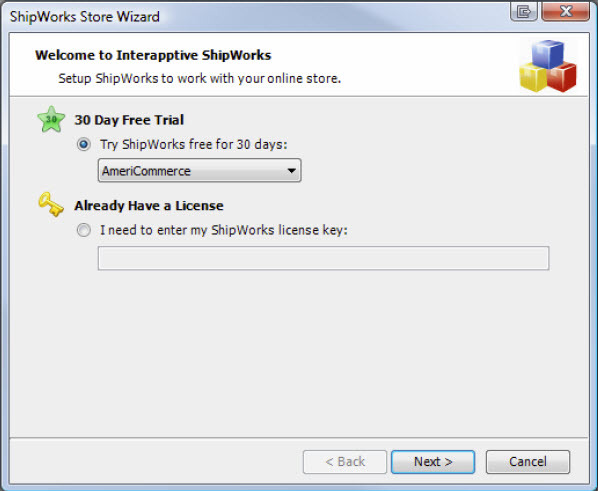 If you have already purchased a ShipWorks license, choose the "I need to enter my ShipWorks license key" option. Enter the license key into the box. It is recommended that you copy and paste the license key to avoid entry errors. After completing the steps below, ShipWorks will be ready to download orders from the AmeriCommerce online store. 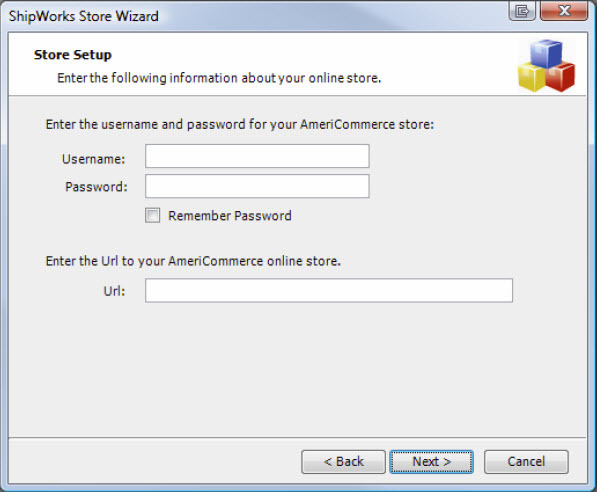 Enter the username and password you use to login to your AmeriCommerce online stores account. NOTE: the username field is limited to 12 characters. Enter the URL to your AmeriCommerce online store. Click Next and continue through the setup wizard. Choose the store you would like to use with ShipWorks. 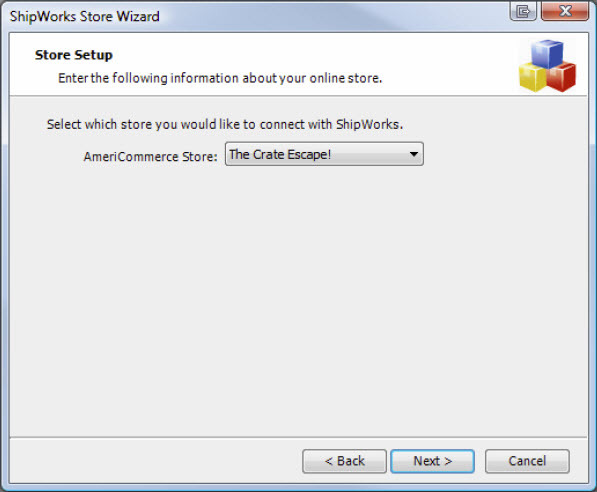 Note: ShipWorks supports connecting to multiple AmeriCommerce online stores. Once you have completed the setup for the first store, you can add additional stores by choosing "Manage > Manage Stores > Add Store (the green plus icon), then proceeding through the remaining setup steps. Configure Automatic Shipment Updates. 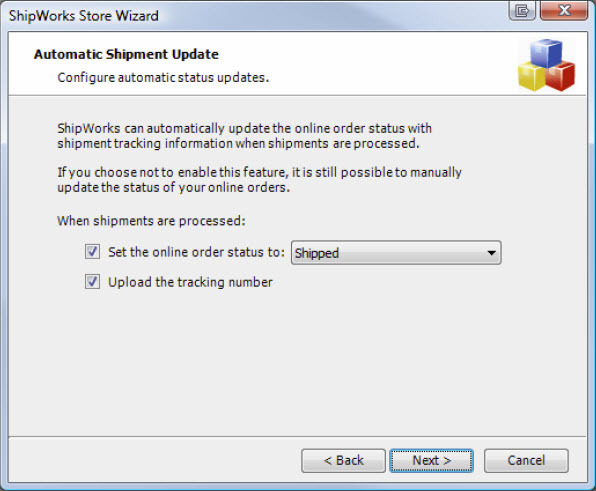 ShipWorks can automatically update the online order status with shipment tracking information when shipments are processed. You can choose the specific status to be set in the AmeriCommerce online store after a shipment is processed in ShipWorks, and whether or not to upload the tracking information. By default, the online order status and tracking uploads are enabled, with the status being set to "Shipped" in the AmeriCommerce online store. 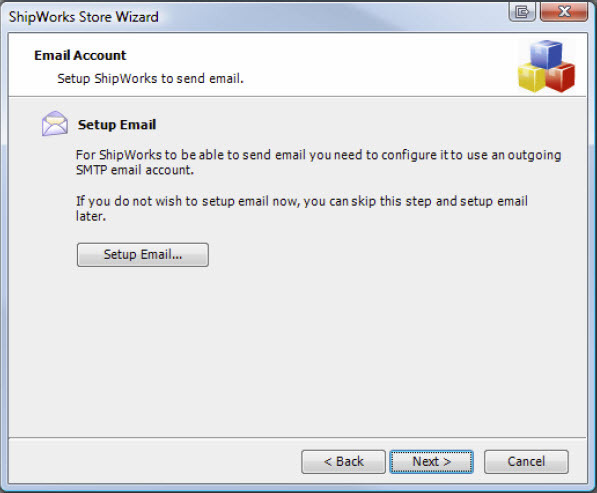 For ShipWorks to be able to send email, you need to configure it to use an outgoing SMTP email account. You can skip this step and setup email later if desired. You can edit your contact information as needed. This information will print on any invoices, packing slips, or other template based documents you might generate from ShipWorks. General setup is now complete. You can click the green "Download" button at the top of the main screen to download your orders from the AmeriCommerce online store. For additional support, please refer to the built-in help document in ShipWorks by choosing "Help > About Shipworks". You can also contact the ShipWorks support team toll free at 1-800-952-7784, Monday through Friday, 8AM through 5PM CST, email support@shipworks.com, or visit their online support forum at www.shipworks.com/support.